In Kansas City, Westport hosts pub crawls and raucous weekends for Great Plains residents flocking to the big smoke. Nearby Country Club Plaza has glitzy high-end shops, splashing fountains and the beautiful Nelson-Atkins Museum. Surprises in Kansas City also have a sinister flavor. Just two blocks from these wealthy enclaves, past the open air barbecue restaurants and jazz joints, are entrenched pockets of poverty and crime. After checking in, I head downstairs for free drinks at the nightly manager’s reception. Seemingly the entire hotel clientele is packed into the windowless basement, knocking back huge plastic cups of Miller Lite. I grab a beer and exchange stories with a group of Nebraskans. They’re down from Omaha for the weekend. We talk about recent floods in Nebraska and Australia. They invite me to join them for dinner. I’ve had one too many drinks and instead retire to bed with a pizza and the TV tuned to the NBA. 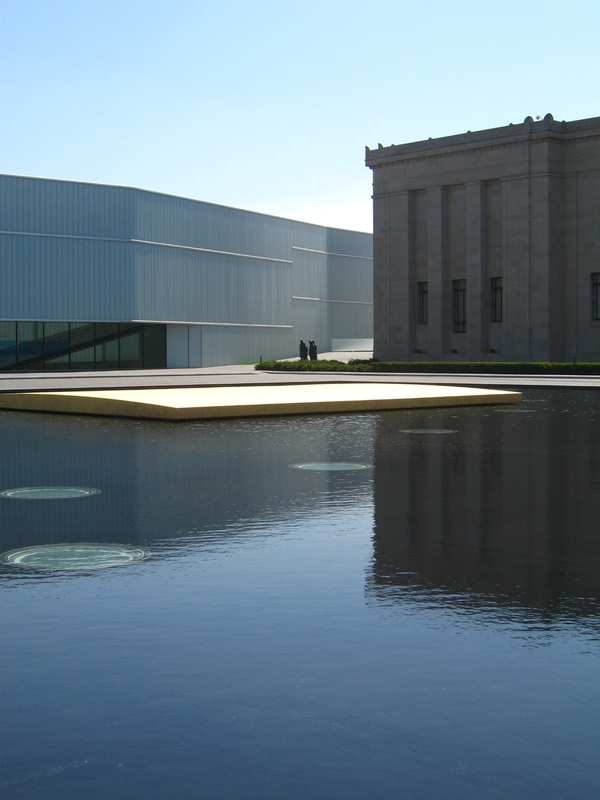 The next day I head to the Nelson-Atkins Museum. The new wing’s glass triangles and large reflecting pool are juxtaposed against the original, grand Greco-Roman building. It’s Monday afternoon and the museum is closed to the public. I get a VIP tour of the museum’s highlights from Randy Griffey, Assistant Curator for American Art. Our first stop is the marble-walled Italian Renaissance gallery in the old building. The lights are turned off in the gallery. I feel warmly enclosed by art on all sides, the rich scent of oil paint filling the room. I imagine myself as the owner of these priceless paintings, walking down through the gallery at midnight to grab a snack. Griffey, a tanned, snazzily dressed man in his thirties, turns a few lights on, breaking the illusion. 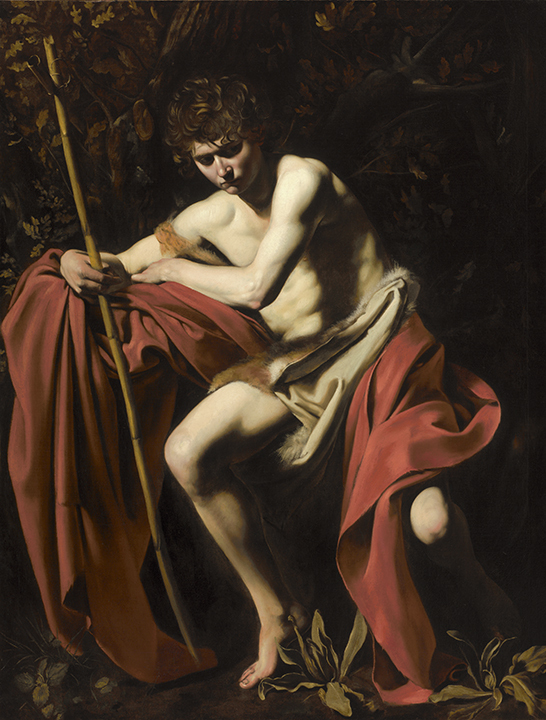 He points me to the museum’s Caravaggio painting, ‘Saint John the Baptist in the Wilderness’. In his opinion, it his one of the best in the country. We head downstairs in the old building, through a tangle of narrow staircases, locked doors and bared pipes. 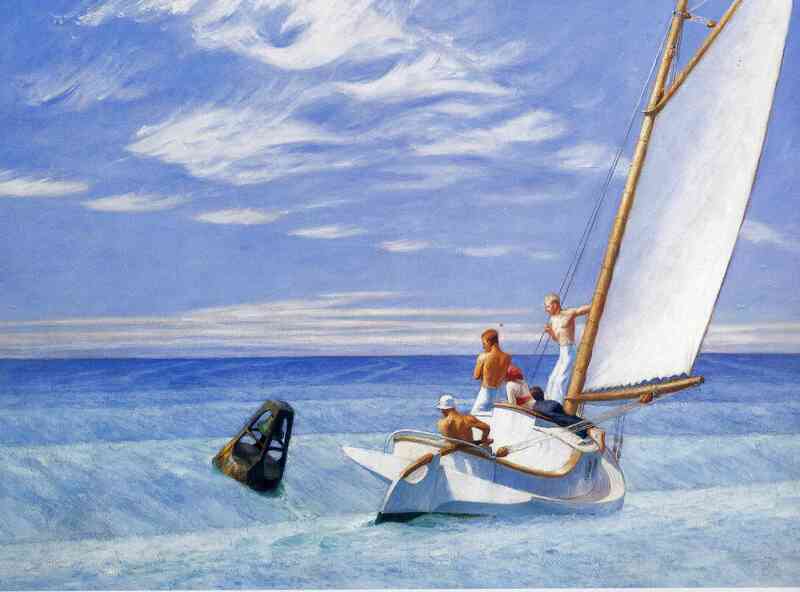 Hopper’s ‘The Dory’ (1929) waits here for me. It has been rudely pulled from storage for my visit. It has been in storage since its last public showing in 1992. ‘The Dory’ portrays a fisherman in a dory, or small rowing boat. The scene is just off the rocky coastline of Cape Elizabeth, Maine. 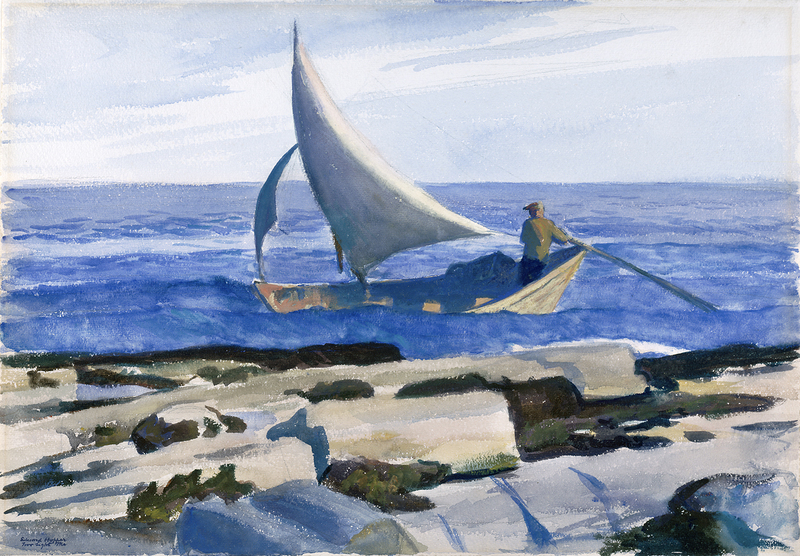 ‘The Dory’ is reminiscent of Hopper’s famous sailboat painting, ‘Ground Swell’, in Washington’s Corcoran Gallery of Art. Both pictures depict the ocean as a solid substance, an undulating terra firma which one critic described as ‘cast concrete’ in appearance. Just as in ‘Ground Swell’, the dory’s occupant is staring at the water without apparent emotion or motivation. The overall effect is discomfiting: is this a dream? If so, could it turn into a nightmare? The idea of Hopper being an abstract artist defies most categorizations of him. He is known as the über-realist of his time. He was also one of the only realists to prosper amidst the rise of Abstract Expressionism after World War II. Another reason for Hopper’s continuing popularity post-World War II was the incorporation of elements of abstraction, and even surrealism, into his pictures. ‘Compositionally,’ Griffey says, ‘there’s an abstract quality of his work generally. He never becomes an abstract painter but he’s so obviously concerned with formal issues of composition and form and that makes his work less dated stylistically.’ Later in Hopper’s career, these elements became more prominent as his scenes became more fictive and contrived. Does somebody in Kansas City love you? What’s your favorite Kansas City neighborhood? Always an intriguing question about why Hopper stayed popular during the heyday of Abstract Expressionism. One answer of course is simply because his work is visually just so strong. Perhaps another is that he had the Curator of the Whitney Museum Lloyd Goodrich as a champion of his work. One sad detail, the Corcoran Gallery in Washington, DC went belly up for financial reasons (amazing in itself in a city with as many 1%ers as DC). The National Gallery got first dibs on taking works from the Corcoran’s Permanent Collection. Not sure but I’d be surprised if their picks didn’t include Hopper’s Groundswell oil. Thanks Philip. I agree with your thoughts. ‘Strong’ is a word commonly used to describe Hopper’s pictures, by everyone from Jo Hopper through to us, and it still doesn’t prepare you for the experience of seeing them in person. I’ll come back to other theories about why Hopper remained so popular over the course of this blog. Hopefully they’ll engender some robust discussion! Thanks for looking into this Bonnie. The NGA has such a good Hopper collection (which I’ll visit in a couple of months), they hardly needed another one. But it is a good home for ‘Ground Swell’. I found your site through a search for E. Hopper’s The Dory about which I knew nothing despite being a fan of Hopper and Kansas City. Not on view to date. You are doing some nice work. It is a bit of a slog for one trained in the world of medicine, but I made it to your words on The Dory. You seem to understand Hopper. Thanks for the comment. I’m glad to hear you found the site and enjoyed it. I too am a doctor and completed this project during a break from my residency. It was challenging, rewarding and inspiring! PS. If you contact curators / registrars, they may be able to arrange private viewings of watercolors, as they are so rarely on display.